I normally don’t post any such rants on social media because it’s annoying but this one I can’t let go! 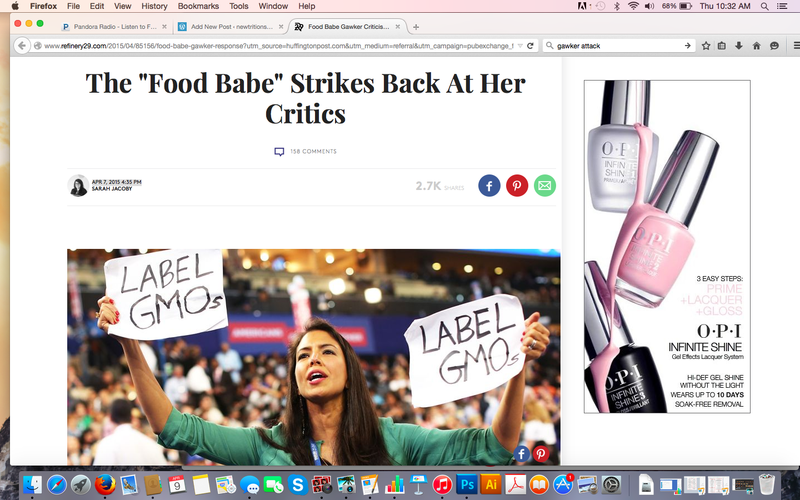 All day Tuesday this Gawker attack on Foodbabe was trending on Facebook. I had multiple friends post about it and I couldn’t help but just feel baffled of those opinions coming from people I know!!!! I mean really, are you a food expert to have any sort of opinion?? Are you doing all you can do to better your health? Surprisingly, the people posting about this aren’t so healthy, or in shape for that matter therefore I don’t think their opinion counts at all. To sum it up, this is what I think. These people who posted yesterday about the blogger Foodbabe saying she’s a fraud etc. need to take some time to pick up a book and educate yourself about the food system in the United States. It’s a shame that when one line out of the entire interview/ post is headlined the person sharing the information gets bashed for false accusations. This girl doesn’t claim to be a doctor, nor does she claim to be a scientist or anything for that matter. What she does claim to be is a food advocate for a better food system. I only speak from experience having a blog myself and constantly trying to educate people that small choices with food quality can really change the way you look, feel and prevent overall disease in your future. Like anything, nothing is promised but I think we can all agree that the food system in the United States falls very low on the totem poll compared to other countries and the diseases that cause the majority of deaths per year (heart disease, diabetes, cancer) can generally (not always) be prevented by lifestyle changes… But also, once again the the highest death rates due to these diseases are in the United States. We live in an era where there is no accountability. The easy way out is to go to the doctor for chronic pain, or ANYTHING for that matter. We don’t spend money on food, heck we don’t even have dinner at the dinner table anymore. Everything is about being the fastest and the cheapest. If you don’t believe in organic and are fine with pesticides please take some time to read about the correlation between cleft lip and runoff water from those unorganic concentrated food operations, or DDT and mental illness. Autism, ADD, Celiac Disease, IBS, Crohns ….all of these diseases that are brushed off by most because they don’t want to make personal changes. These things are not normal people!!!!!!! Just remember anytime you make an opinion of someone and their beliefs to first be educated. A better food system is beyond necessary for people to care more about. It’s your body. It’s your mental health. We live in a more than privileged country, I don’t understand why this is so difficult to improve. Know your farmers, and know your food. Believe it!!!!!!!! !